13th September To 13th October 1914. On the night of the 12th the opposing forces were within the Aisne area, but it was not until the 13th that the British crossed the river. So far the Allies had made a successful advance of between fifty and sixty miles against the retreating Germans, but it was soon dis­covered that the latter had prepared a position on which to stand at bay—whether only for the purpose of fighting a rearguard action, or as a solid line of de­fence was not at first known. To Sir John French one thing seemed certain : that at least three German Army Corps were guarding the passages of the Aisne, and on the morning of the 13th September he ordered his troops to move forward and "make good the Aisne." The valley of the Aisne runs approximately east and west, varying in width from half a mile to two miles, and having sides sloping up to a height of some four hundred feet both on the north and on the south. In places the slopes are steep, with bluffs and quarries, bold spurs and ravines; here and there under-features crop up, to form downs or minor plateaux, while elsewhere the ground rises, from the wide, sluggish, and unfordable river, gently upwards, and is cultivated, more especially in the vicinity of the farms and villages, of which there are several. Each side of the valley is dotted with woods, extending up to the crest, and in a great measure concealing the actual edge of the plateau above. That portion of the river which came within the British sphere of action, viz., between Soissons and Villers (about 15 miles), had eleven crossings, all of which it was found were under the enemy's artillery fire from the northern slopes of the valley. And the German batteries were too far distant from the southern ridge to be silenced by our guns. 2nd Division (4th, 5th, 6th Infantry Brigades). 3rd Division (7th, 8th, 9th Infantry Brigades). 5th Division (13th, 14th, 15th Infantry Brigades). 4th, Division (10th, 11th, 12th Infantry Brigades). 6th Division (16th, 17th, 18th Infantry Brigades) not complete until 16th September. The passage of the Aisne was not easily effected, since the enemy had taken care to destroy all save one of the bridges, while that not destroyed he kept under artillery or machine-gun fire. Still, on the 13th Sep­tember, the British advanced to the south bank at various points and commenced to repair such broken bridges as they desired to use, and throw pontoons across. By nightfall, and after considerable opposition, a proportion of the force had established itself on the right or north bank of the river, when the enemy with­drew for a distance of about two miles to a strongly-entrenched position, leaving detached posts, supported by heavy artillery, on the spurs in front. alongside the destroyed road bridge at Pont Arcy, and threw out outposts for the night facing north and north-west. 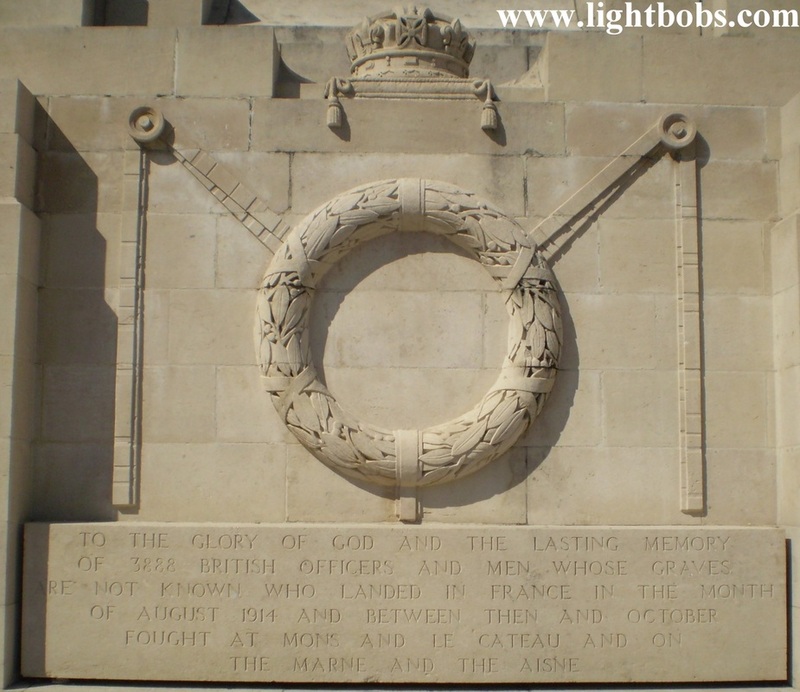 The 1st Army Corps (of which the 5th Brigade formed part) was on the right of the British Force, having on its right the French 5th Army, and on its left the British IInd and IIIrd Corps, on whose left again was the French 6th Army. On the 14th September the passage of the river was continued, and the fighting became severe, more par­ticularly for the 1st Army Corps, on the right of the twenty-mile British line. Early in the morning the 2nd Brigade of the 1st Division which had reached Moulins the day before, pushed on towards Vendresse, with a view to covering the advance of the remainder of the Division. Within a few hours the fighting in the neighbourhood of the crossroads near Troyon became of the fiercest description, but the 2nd Brigade even­tually succeeded in gaining its immediate objective by establishing itself on the ridge opposite the German trenches. Westward, near Verneuil, the 3rd, 5th, and 6th Brigades were engaged at the same time, though with less result, the enemy resisting stubbornly and counter-attacking throughout the day. On the left again, i.e., south-westward, the 4th (Guards') Brigade fought its way upwards from Chavonne to Soupir, thus getting in touch with the 6th and 5th Brigades. While the 1st Army Corps was making this brilliant advance, the IInd had been hung up on the south side of the river for want of bridges. The 3rd Division, coming to the river at Vailly in the morning, found that the bridge had been broken at the northern end, but by a single plank over the gap two brigades managed to file across by noon, while the 3rd Brigade negotiated the river on rafts, which occupied most of the day. Pressing forward, they made good the high ground above, and occupied satisfactory positions on the two spurs Maison Rouge and Ostel, the 9th Brigade joining up with the 4th (Guards') Brigade, in the vicinity of the farm La Cour de Soupir. The other Division of the IInd Army Corps—the 5th—were not so fortunate in crossing the river even as the 3rd Division, as the ground over which they essayed to pass to the south bank at Missy was swept by the enemy's fire. One brigade was forced to remain at Sermoise, but the other two bri­gades succeeded in the afternoon in crossing at Moulins des Roches and joining in the heavy fighting which they found going on in front of them. Filling the gap between the 3rd Division on their right and the 4th Division already on their left, these two brigades first assisted in beating back a German attack on the 4th Division, and then attempted, but unsuccessfully, to capture the Chivres heights. The 4th Division had got across, one brigade by means of boats between Soissons and Venizel, another by the Venizel Bridge which had been repaired, and the third by a pontoon bridge close by. On the night of the 14th the British north of the Aisne were established on a general line running from a point on the river a little below Venizel, through Missy, Vailly, La Cour de Soupir, and Vendresse, to a point on the Chemin des Dames, a little to the east of Cerny; and the resistance offered by the enemy during the day now made it evident that he intended to stand and fight on the position which he had prepared. Described generally, his front from west to east ran north of Compiegne, north of the Aisne, and north also of Reims and Verdun. From this time onwards the British made little or no headway, although every effort was put forward. Daily engagements took place, and the Germans brought up heavier artillery to pound our trenches. But open warfare here was practically at an end, and its place was taken by the new trench warfare, in which attack and counter-attack alternated for the next few weeks. Neither side gave way, and the opposing lines of trenches remained almost unchanged. In the meantime, while the British held the Germans to their position in the Aisne valley, General Joffre reinforced the French 6th Army and ordered it to drive in the enemy's right, and, if possible, envelop it. By the 23rd September this movement began to make itself felt, and the Germans were forced to draw back their right, until, at the close of the month, this flank was facing westward, with the extreme right near St. Quentin. On the east of the British, the French armies were also busily engaged with the German left, up to the frontier of Alsace-Lorraine, thus preventing all attempts on the part of the enemy to work round the right flank of the Allies. Foiled in his attempt to break through to Paris as originally planned, and realizing that matters had arrived at a deadlock, the enemy bethought him of the easier route by way of the plains of Flanders; so, leaving sufficient forces to hold his heavily entrenched positions, he drew off the remainder in a north-westerly direction. And the Allies, perceiving their enemy's intention, set to work to frustrate his fresh designs. Commanding Officers (Lieut.-Colonel Davies's) Diary. In the afternoon (about 5 o'clock) we crossed the river by a pontoon bridge which had been constructed by the side of the broken bridge at Pont Arcy. A few shells were fired at us, and some of the Connaught Rangers were hit. On the farther bank of the river the whole of the 5th Brigade took up a line of outposts from near Verneuil to Soupir. Our (52nd) part was from Ferme de Metz to Soupir (exclusive), the Worcestershire being on our right, and the Connaught Rangers on our left. I made Regimental Headquarters in an estaminet close to the canal bridge, west of Moussy, and, securing a bed to sleep on, had 3 or 4 hours' sleep. D Company, in reserve, were also billeted near this bridge. During the night, which was wet and cold, we heard a good deal of rumbling of wheels on the ridge in front of us, and early in the morning (14th) some German cavalry appeared near Ferme de Metz, and exchanged shots with a piquet of A Company. 5th Brigade Head­quarters were at Verneuil. Brigade were also strongly opposed on the wooded hill above Soupir. We remained where we were until the afternoon, being considerably shelled with both high explosive and shrapnel. Soon after midday I was ordered to collect the Regiment at Moussy, with the idea of pushing forward on the left of the Worcestershire, who were also to advance. However, the 6th Brigade were all over this part of the ground, and we were not used in this way. Eventually (about 5 p.m.) I was ordered to take the Regiment to Soupir, to act as a reserve to the 4th Brigade. The road to Soupir had been a good deal shelled, but by keeping to the left of the road, where the ground was a little lower, and by moving well strung out, we apparently escaped observation, and were not shelled at all. 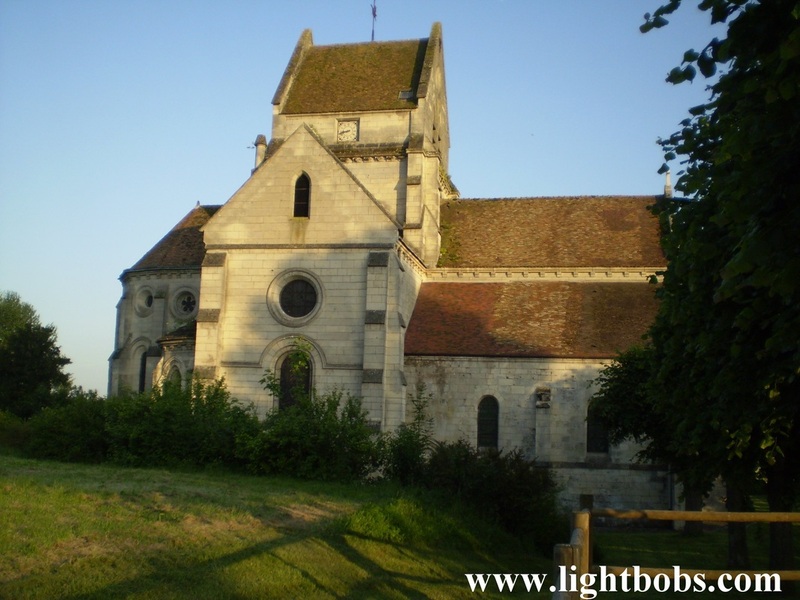 We were billeted in the village of Soupir, but when we had got to sleep we were called up almost at once (about 11 p.m.) to go up the hill and reinforce the 4th Brigade, the reason being that there was a good deal of firing going on. This, however, turned out to be an attack on the 3rd Division, on our left, which, apparently, was repulsed. We were, therefore, sent back to our billets, and slept the remaining three hours of the night. We had all our men under cover, chiefly in barns and sheds. During the day our losses — all from shell-fire — were about 45, of whom, fortunately, only 4 were killed. We did not get a chance of firing back, as we saw no German infantry. September 15th.— (Soupir Village.) The day opened quietly, but at 6 a.m. the Germans began shelling the 4th Brigade, and later on in the morning they began dropping shells near our village. Their shelling, however, was very ineffective, and, in fact, we had quite a rest-day — a rest we all much enjoyed, the first real rest we have had since the 20th August. September 16th. — (Soupir Village.) Still in Soupir, in reserve, and had a fairly peaceful time. A good deal of shelling all around, but no shells came actually where we were. In the evening got orders to relieve the 2nd Battalion Grenadiers the next morning in a farm called La Cour de Soupir, a mile and a half away. At about noon C and D Companies were sent up to La Cour de Soupir as a support to the 4th (Guards') Brigade, and towards evening a most unlucky big shell landed amongst them, killing Worthington, Mockler-Ferryman, Girardot, and 8 men, and wounding Higgins, Evelegh, Tylden-Pattenson and 8 men, besides causing 40 or more casualties to the Grenadier Guards. Our men had been in a large cave, but owing to some firing in front, had been ordered out of the cave by the officer commanding the Grenadiers, so that they should be ready to act. Just as the head of the leading company was coming out the shell fell. These are the first officers of the Regiment to be killed. September 17th.—(Soupir Village to La Cour de Soupir.) Went up and relieved the 2nd Battalion Grenadier Guards at 4.30 a.m. It was a good position to hold, and we were able to make those men who were not actually in the trenches very comfortable in caves and elsewhere under cover. We found trenches already dug, and at once set to work to improve them. Besides the wounded there were a considerable number of dead, both British and German, lying about, but the enemy's fire pre­vented us from doing anything with them by day, so we had to do all the burying at night. September 18th.—(La Cour de Soupir.) A very quiet day, but wet and muddy. September 19th.—A quiet morning, but at 1.15 p.m. we began to get a very heavy shelling, which continued until 7.15 p.m. It was directed at the trenches themselves, at the farm, at the mouths of the caves, and at the road which ran between the farm and the caves; and it was pretty accurate. A and D Companies were holding the trenches. I stayed in the caves, with B and C Com­panies in reserve, for some time; but about 3 30 p.m., when infantry fire began, and I received news of an advance of some German infantry, I brought out B Company. Wood took most of them round the south side of the farm to support or reinforce C Com­pany, who were on the left. I went to the forge in the farm, with 1 1/2 platoons, under Turbutt, as a reserve for A Company on the right. Here I was better situated for discovering what was going on than at the caves. Many shells came over, but they did not actually hit the forge. The enemy's infantry did not really come on, and, as it happened, the reserves were not wanted. It was not a pressed-home attack, but was possibly intended to keep us in our trenches during the artillery fire, or to be turned into a real attack if they found that we were shaken by their artillery fire. When our men in the trenches fired at them they went back. At dark (about 6.30 p.m.) things became quieter, and we had a peaceful night. Our losses, entirely from shell-fire, were about 35, including one officer killed., one died of wounds, and one wounded. A Company had 18 casualties, caused principally by two H.E. shells falling actually in the trench. In the evening Lord Cavan, who had just come out to command the 4th Brigade, came up, and asked if, after the heavy shelling, we would like to be relieved, but I said that we would stick it. In the ordinary course it would have been our day to be relieved, as we had done three days; but I asked this morning to be left here, as it seemed to me to be really better to remain in the place we know than to go down to Soupir village for one day's rest, with every chance of being sent to another part of the line about which we know nothing. September 20th.—(La Cour de Soupir.) A quiet day, with very little shelling ; but in the evening, just at dusk, there was a good deal of infantry fire. September 2lst.—(La Cour de Soupir to Dhuizel, 6 1/2 miles.) At night we were relieved by the Leinster Regiment (of the 17th Brigade, 6th Division), and were ordered to rejoin the 5th Brigade at Dhuizel. We did not get off until 1 a.m. (22nd). We crossed the Aisne at Chavonne, and marched, via Vieil Arcy, to Dhuizel, where we arrived after daylight, found the 5th Brigade there, and then went into billets and slept. General Haking had been wounded. Lieut.-Colonel Westmacott, commanding the Worcestershire, is in temporary command of the Brigade, with Stevenson (H.L.I.) acting as Brigade Major. The Worcestershire and the Highland Light Infantry have each lost an equal number of officers to ourselves. September 26th.—(Dhuizel.) Early in the morning and during part of last night there was considerable artillery and infantry fire. We were held in readiness to move, but were not called for. We heard later that the firing was caused by an attack which the 21st German Division made on our 1st Division. The attack was repulsed with considerable loss to the enemy. September 27th.—Still held in readiness to move, but were not wanted. Very little shelling today. September 28th.—Continued digging the back line trenches on the heights to the south of Dhuizel village. September 29th.—Out again finishing off the trenches. In the afternoon we got orders to move, across the Aisne to Bourg, 3 ½ miles, which we did after dark (7 p.m.), and took over billets from the Connaught Rangers. Quite good billets. The duties here entail finding a few guards, digging some trenches at night, and cleaning up the streets of the village. The Headquarters of both the 1st and 2nd Divisions are in Bourg. October 1st.—(Bourg to La Cour de Soupir, 4 miles.) In the afternoon got orders to move at 7.30 p.m. back to our old line at La Cour de Soupir, where we took over from the Leinster Regiment. They had carried on the improvement of the trenches, and there are now good communication trenches all round. Things are much the same as before, except that shelling is rather less and sniping rather more. The nearest German trenches are now 550 to 600 yards from our line. October 2nd.—(La Cour de Soupir.) Misty morning. Did not clear until 10 o'clock. As the Highland Light Infantry have such a long line on our right, we have had to take over from them one company's length along the edge of the wood, so we now have three companies in the trenches. In the mist this morning one of our scouts (Hurst), getting too near the German trenches, was shot, but whether killed or a wounded prisoner is not at present known. October 4th.—Again some shelling at the same part of our trenches and A Company, who were holding it, had 1 killed and 9 wounded. The Germans are now using high explosive shrapnel which, bursting fairly high, throws pieces backwards as well as forwards, and gets men although they may be well covered from the front. October 5th.—Still at La Cour de Soupir. Some shelling again at the same trenches, but a lot of trouble had been taken to make the cover thoroughly good, and there were no casualties there, but 6 men were wounded by shrapnel in the farmyard. Our arrange­ments for holding the trenches are now as follows : D Company permanently in on the left, while A, B, and C take the remainder of the line, each with two days in and one day in reserve. October 6th.—Very few shells, and no damage. About 10 p.m. there was some infantry fire, probably started by one of our patrols meeting a German patrol. The fire was quite harmless, and we made little reply. It died down in about half an hour. October 7th.—(La Cour de Soupir.) Our own artillery is now more active than that of the Germans. This is quite the reverse of what was the case three weeks ago, when we were first here. October 8th.—The nights are now cold, with a white frost in the early morning; but the days are perfect, with a bright, warm sun. The country about this place is pretty, and there are some fine woods, in which one would enjoy walking about if the Germans would not drop shells into them. We were not shelled at all to-day. October 9th.—More shelling than usual today, and a good many fell in the farm, but no one was hit. Luckily the first shell was a bit wide, and so gave us warning to get into the cellars and caves —the only safe places. We get mail regularly every day now. October 10th.— The casualties in the Regiment up to date are 5 officers and 32 men killed, and 5 officers and 110 men wounded. October 11th-12th.—Still at La Cour de Soupir, but preparing to move. Our part of the line was not shelled on these two days. Officer and his second in command came up in the afternoon to look round, and were quite pleased. At 11 p.m. the French battalion to relieve us arrived, and we were able to march off half an hour after midnight. The Germans appeared to be nervous, and sent up a lot of lights directly it got dark. Possibly they had news of the arrival of the French, and thought that we were being reinforced with a view to attacking them. 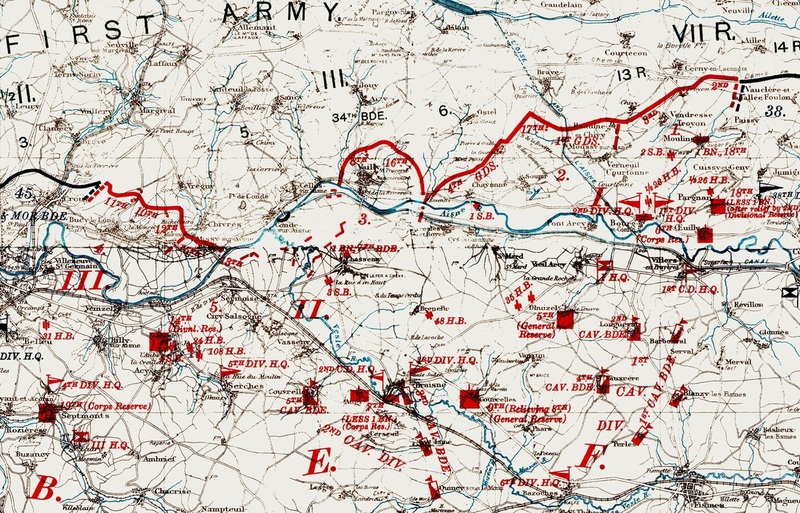 The Battle of the Aisne map from the Official History. The Aisne map from the History of the Second Division. 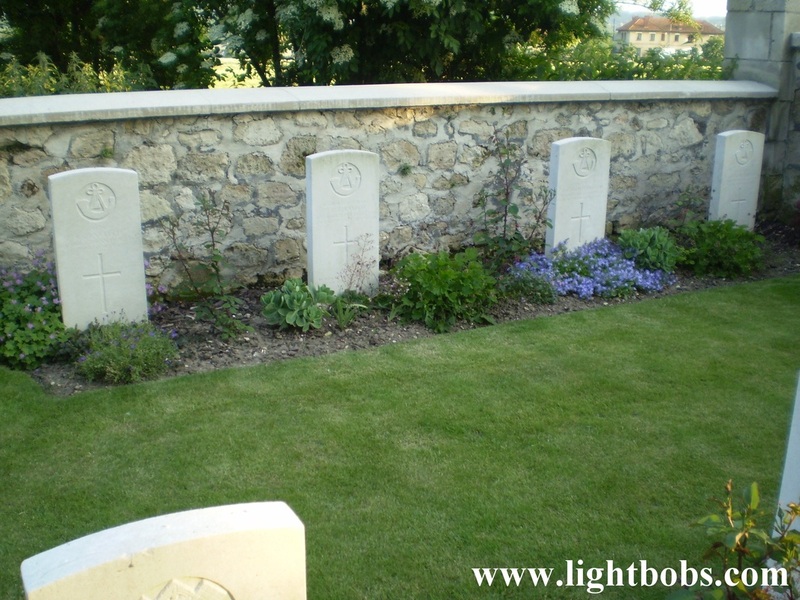 The grave of four officers of the regiment in Soupir Churchyard. La Ferte-Sous-Jouarre Memorial to the Missing. 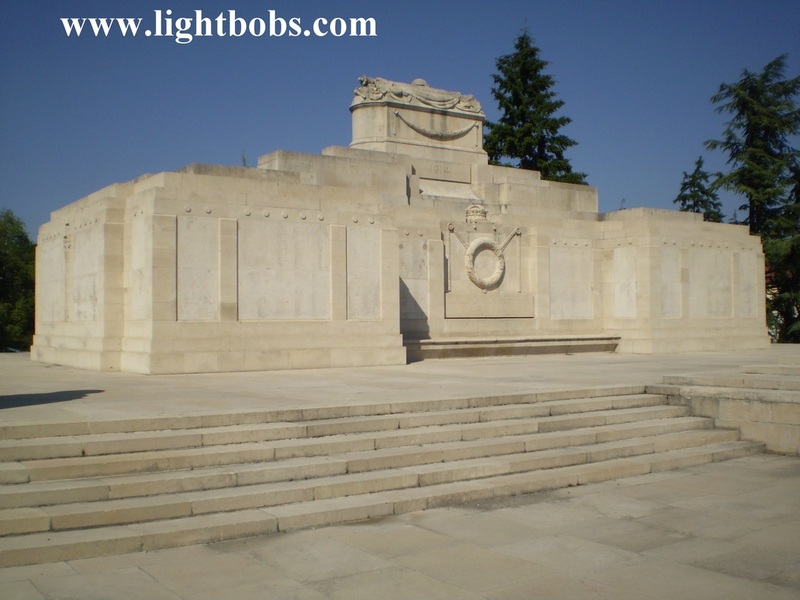 La Ferte-Sous-Jouarre memorial list the names of 3,888 officers and men of the British Army who have no known grave killed between August and October 1914. La Ferte-Sous-Jouarre memorial list the name of 9 members of the regiment who have no known grave. 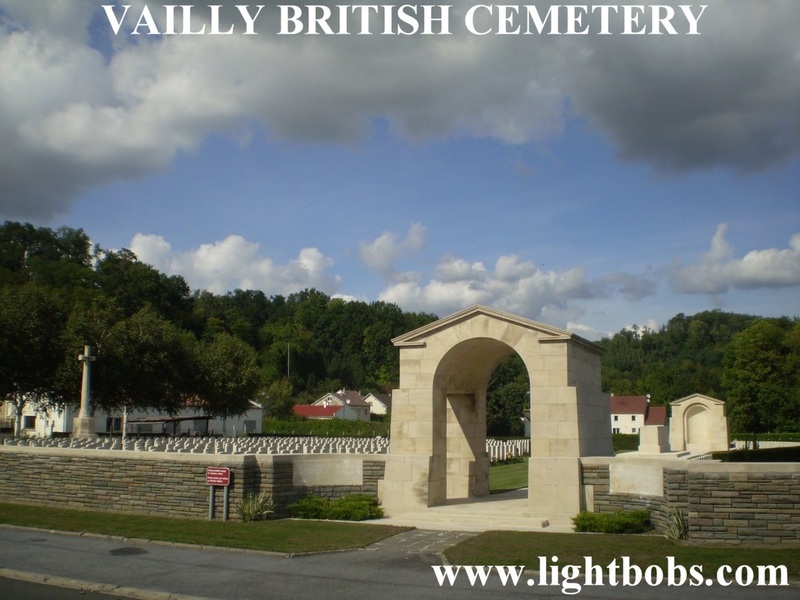 22 of the battalions casualties from September 1914 lie in this cemetery.